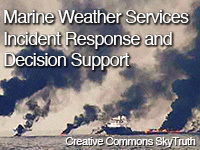 Marine Weather Services Incident Response and Decision Support provides guidance for forecasters tasked with supporting oil or chemical spills and other marine-focused incidents. The lesson follows an example spill event to help demonstrate marine forecasters' responsibilities for coordinating with emergency managers, other NOAA line offices, and governmental agencies and outlines best practices related to effective communication. The course provided some useful information. this is all on the job training, as well as continuing education credits at the university level for me.